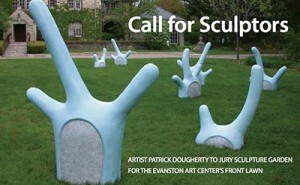 Evanston Art Center is accepting submissions for small-scale outdoor sculptural works through December 20, 2013 to be on view the spring – summer season of 2014. For over twenty years, the Evanston Art Center has exhibited a single large-scale, site-specific sculpture out on the lawn. This program, referred to as “Sculpture on the Grounds”, has garnered both regional and national press attention. Projects have been covered by media outlets such as WTTW’s ArtBeat and Art Across America, Sculpture Magazine, Chicago Reader, Chicago Tribune, Chicago Sun-Times, New Art Examiner, and The Pioneer Press. Participating artists have included Shawn Decker, Matt Dehaemers, Darrin Hallowell, Herb Parker, and Patrick Dougherty. Thousands of people, from the area and out of town, stop by the front lawn of the Evanston Art Center throughout the year. This is an opportunity to have your work seen by a large and diverse audience. Materials to Send: 3 to 5 jpeg images or drawings of sculpture, CV, short description of sculpture’s connection with the site. Entry Fee: a $35 entry fee, which can be processed on EAC web site, or by check at EAC reception desk. All Artists are welcome to submit. Delivery and Installation are the responsibility of the artist. Insurance: All works will be covered by EAC insurance policy. Works can be for sale.